What's New with La-Cemeteries© ! Calcasieu Parish is up to date with the Louisiana Cemetery Board. Eight cemeteries were added. Review of Calcasieu US GenWeb Archives resulted in three more cemeteries being added. About 24 cemeteries were added after a Find A Grave review. "Red River Sankofa Historical Society" web site has numerous African American cemeteries in eight parishes, with transcriptions. Most of these cemeteries are already included in La-Cemeteries. After review, a few new ones were added to La-Cemeteries. Caddo Parish is up to date with Find A Grave and Louisiana Cemetery Board listings. Thirty-four cemeteries were added. Bossier Parish is up to date with Find A Grave and Louisiana Cemetery Board listings. Twenty-nine cemeteries are added. Bienville Parish is up to date with Find A Grave and Louisiana Cemetery Board listings. Corrections made in Webster Parish to name of 'Nickerson Family Cemetery' to 'Nickerson Graveyard' and to location of 'Pilgrims Rest Cemetery' to Shongaloo. Corrections by Yon Hafer. Bienville Parish is up to date with Louisiana Cemetery Board. Beauregard Parish is up to date with Louisiana Cemetery Board and Find A Grave Listings. Added pictures of Catholic Cemetery in Natchitoches Parish including ten Confederate soldiers. Added pictures of American Cemetery in Natchitoches Parish including one American Revolution soldier, two WWII soldiers and 11 Confederate soldiers. Avoyelles Parish is up to date with Louisiana Cemetery Board and Find A Grave Listings. Unknown Cemetery 1 in Assumption Parish is identified as New Mount Carmel Cemetery. Unknown Cemetery 5 in Assumption Parish is identified as Christ Episcopal Cemetery. Unknown Cemetery 9 in Assumption Parish is identified as Canaan Baptist Cemetery. Boatner Family Cemetery in Assumption Parish added as aka to Rosedale Plantation Cemetery. Pugh Family Cemetery in Assumption Parish added as aka to Madewood Cemetery. Church of God Prophecy Cemetery, Gibson Family Cemetery and Wesley United Methodist Cemetery in Assumption Parish added from Find A Grave. Through September, Acadia, Allen, Ascension and Assumption parishes are up to date with Louisiana Cemetery Board, Find A Grave and discoveries. Added Bowman-Dedon Cemetery in West Feliciana Parish. Information from Marlon Ebey. Added Young-Rayon Cemetery in Acadia Parish. Unknown Cemetery 3 in Washington Parish is identified as Bruce B. Moses Park. Unknown Cemetery 8 in Washington Parish is identified as Houze Cemetery. Unknown Cemetery 10 in Washington Parish is identified as Bullock Cemetery. Unknown Cemetery 1 in Terrebonne Parish is identified as Mt. Olive Baptist Cemetery. Unknown Cemetery 16 in St. Mary Parish is identified as Greenwood Cemetery. Removed location of Bishop Family Cemetery and Mausoleum in Ascension Parish. 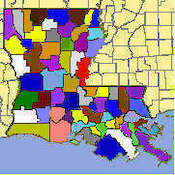 In Ascension Parish, added Ascension of Our Lord Mausoleum, C & C Jackson Memorial Cemetery, Galvez Baptist Cemetery, IWBFM Cemetery (I Walk By Faith Ministry), Macedonia Church of Deliverence Cemetery, Meifert Cemetery, True Light Workshop Center's Cemetery, Unknown Cemetery 2, Womack Family Cemetery, Word of Life Christian Center Cemetery. Unknown Cemetery 6 in Acadia Parish is identified as Mt. Olive Cemetery (from right click on Google Maps). The company that was hosting this site for more than 10 years was bought by another. The new company said they could not (would not) migrate this site to their hosting company. So I migrated this web site myself to a different hosting company, namely Dream Host. It was not a pleasant experience considering the size of this web site and it's age. Many pages quit working. Some code no longer worked at all. I have visited and checked most pages, fixing those that did not work. State libraries evidently reorganized the directory structure for cemetery pictures. So, those pages no longer connect. I'll run that down and fix it eventually. The Secretary of State's office has done it again. Three new Secretary's in a row and a new directory structure came each time. At the moment I plan to delete all links to that office. I cannot jump through their hoops at every change. I have concerns that Find A Grave may do the same thing when converting from their old website to their new one. So far, every thing still connects. Microsoft Bing Maps no longer work because of Microsoft changes for displaying Bing Maps. Unless I can find a global cure, Bing maps will become dust on this web site. Please send your comments about what is not working. My thanks for you taking the time to let me know.